We are just now getting our first real blizzard of the season. It has been snowing all day, and tomorrow we may just be snowed in. This is what it looked like yesterday when we went for a walk on the lake. And this is what it looked like today in the early hours of the blizzard. So what do we do when we are getting snowed in? We make snow kachangs. Actually, I’ve never made one before, but decided to give it a try for the second part of Angie’s Fiesta Friday first anniversary celebration where we have been invited to bring a main course or dessert. This recipe is based on a favourite sweet dish of mine that I used to enjoy in Singapore called Ice Kachang, usually spelt kacang. It was a while before I had built up enough curiosity to try it, but once I did I thought it the best way to cool down when on the town, and something that I would have to recreate when back home in Canada. It has taken me a long time. When I first saw it, I was not impressed. All I could see was a tall pyramid of shaved ice, with 3 or 4 garish coloured syrups poured over it. I’m pretty sure the green colour was made from pandan, but have no idea what the others were. When I finally ordered one, I found that this pyramid covered a delicious mixture of adzuki beans, sweet corn, little cubes of agar agar or jelly and a very sweet brown sugar syrup. Sometimes other things like tapioca or coconut milk were added making a kind of sweet pudding salad. Of all the pictures I have found on line, none resembles what I had in Singapore. The original recipe is Malaysian, and seems to have a lot of the pudding on top of the ice shavings. Other pictures show all the ingredients including the ice mixed together. I am sticking with the pyramid shape and only syrup on top. For my recipe I used snow, of course. It takes quite a bit of the white stuff, and I failed to make a really tall pyramid. But as I assembled it outside to give me time to get pictures, my fingers were becoming numb with the cold and harvesting any more snow was out of the question. I intended to use adzuki beans, but was unable to find any, so settled for small kidney beans. I figured with the syrup everything would be sweet enough anyway, and I was right. Besides beans I used sweet corn, cubes from the pealed leaves of my aloe vera plant, and our own maple syrup. Once these ingredients are assembled in any proportion you like, just pile on the snow. The syrup I used to drizzle on top was some wild grape syrup I had lingering in my fridge, but any sweet syrup will do, preferably one made of fruit or berries, or pandan if you are lucky enough to have any. The result, which we did bring indoors to eat, was every bit as good as the Singaporean version but with a distinctive Canadian touch. This is a recipe you can make your own with whatever local ingredients you have, and ice shavings if you don’t have clean snow available. Thanks to Angie at The Novice Gardener as well as this week’s co-hosts, Nancy at Feasting with Friends and Selma at Selma’s Table for managing this event, and to everyone else, enjoy the party! Categories: dessert, recipes | Tags: aloe vera, berries, dessert, Fiesta Friday, foraging, ice kacang, maple syrup, Singapore, snow recipe, wild grape | Permalink. This post and treat makes me homesick, Hilda 🙂 I’m amazed at what you’re able to forage—even snow! So you make your own maple syrup too? Do you make it in your kitchen? Stay warm and cosy today. Thanks Anne Marie. I made some snow recipes last year, and we did our first batches ever of maple syrup in our garage. This year we plan to use a newly built wood shed. Sorry to bring on homesickness. I know when I lived abroad, the only season I really missed was winter. Go figure! Only Hilda would think of a way to forage snow and an aloe vera plant! This didn’t sound appetizing to me but the finished creation sure does! I would love to enjoy one in Singapore!!! What a pristine view! I, too, am so inspired by your success with winter foraging! Thanks Valerie. The effects of the blizzard are not all that bad today. It is sunny, clear and cold as it should be. I can’t get over the unusual combination of ingredients here! 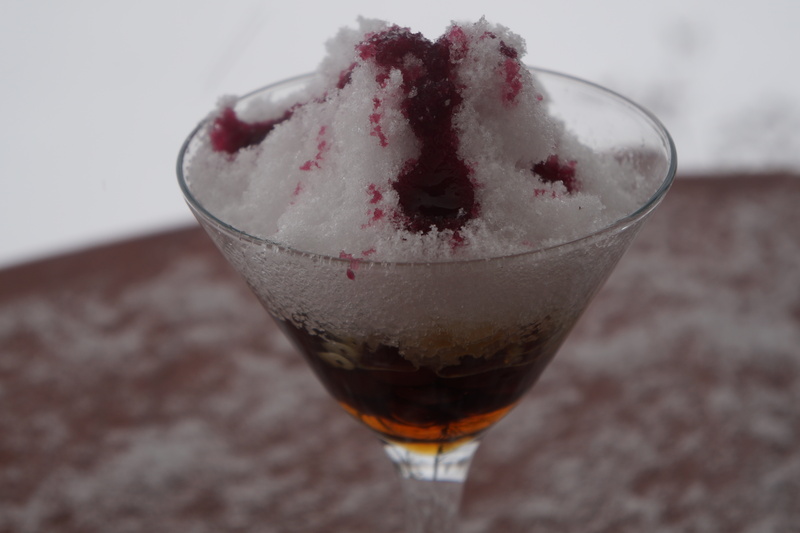 Can we rename the dish “Black bean, corn, maple syrup and aloe vera pudding, topped with freshly fallen snow and grape syrup?” As always, you are so inventive and original, while keeping close to home. THank you for including photos of the weather, it’s awesome! I’d take one of these by the fireplace. You could rename the dish, but that would be a bigger mouthful than the dish itself. Also, don’t you think it’s fun to say “kachang”? The weather has been pretty awesome, a lot more friendly and just as pretty as last year, so I am getting out to enjoy it a little more. Maybe I’ll build a snowman when the weather gets just a tad warmer. Oh yes I much prefer to say “kachang.” I just thought it was funny to renumerate all of the ingredients because . . . I don’t know, I’m weird ? Anyhow, as always it’s a pleasure visiting with you. This is a delightful and inspiring treat, Hilda! I love that Mother Nature provided the base of dish…you are a forager extraordinaire! I wish I had one in my hand right now as I watch the gentle flurries falling outside my window. 🙂 Thanks for sharing your fabulous recipe with all of us celebrating the anniversary of Fiesta Friday… and thanks for not letting any of us down by bringing anything less than unique! Thanks Nancy for the kind words. What a “cool” treat you have brought for us, Hilda – in every sense of the word. I just love how you “Canadianized” a really Asian dish, and you got to use real snow!! I know it is really tasty!! Love your blizzard pix too! We haven’t had any out here on the west coast yet and I am kind of envious of what you are experiencing! I don’t mind a good dump of the white stuff at least once a year! Enjoy the party when you are not shovelling! Thanks Julianna. The shovelling has all been done, with our tractor, and I had nothing to do with it. Perhaps that is why I am afforded the luxury of enjoying winter. Wow! What an interesting mix of ingredients! The snow looks stunning but I could almost feel your freezing cold hands! It was cold. I ideally you should have young children to go and collect the snow for you. Wow this looks and sounds amazing! I love that you used fresh snow for it! Thanks Michelle. Not something you can leave sitting around for long, but enjoying the white stuff in a different way is fun. Our snow storm did not amount too much in the end. Maybe you will be lucky too. Oh brrrrrr, those snow pictures make me want to cuddle up with a good book by a roaring fire. But I know you love it as your pictures attest to. That snow kachang looks delicious, and of course not missing out on the infamous Maple syrup, just lovely! I’ve never heard of this dish. It is certainly unique! We often made snow ice cream when we were young. I was sort of thinking of children when I wrote this. We used to eat snow, but never thought of jazzing it up at all. This reminds me, too, of the snow ice cream we made when we were young. We would have to drive a couple hours to find snow first. Your recipe is much more complex and interesting. It would be perfect to cool us off here in Arizona in the summer, but I would have to go the shaved ice route! 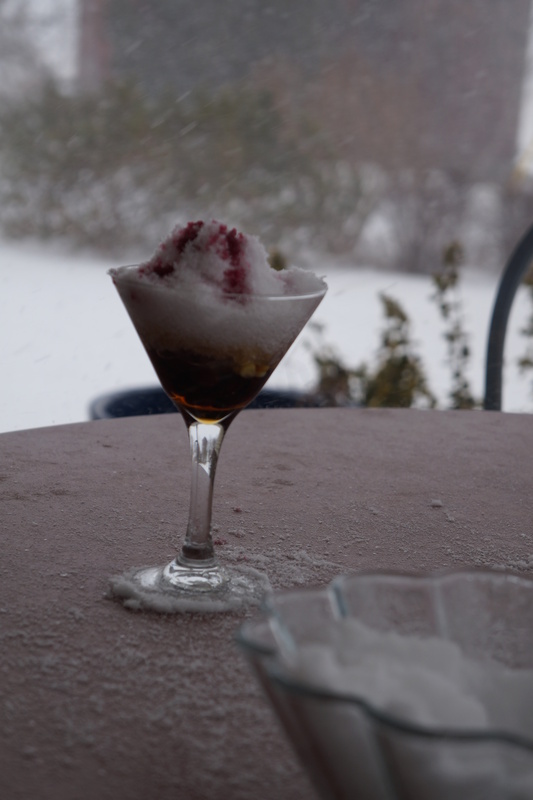 Shaved ice would work of course – or maybe a really light sherbet! Oh my gosh this looks brilliant Hilda. ..
How beautiful Hilda! We have something similar in India called ice-gola: shaved ice with syrups, we have it especially by the seaside in Bombay. Yum! Thanks Naina. I think it is one of those recipes where you can use whatever you like and just have fun with it. Hm, I think the two snowflakes I saw today will not be quite enough to replicate this. So I probably have to wait until next year to try this – but damn, you made me curious! Super innovative. And interesting that you have lived abroad; very cool. Bringing a touch of your journey home – nothing better. Looks so cold out there… stay well-bundled for your first blizzard of the season.